Here’s why I’m travelling 4735 miles to go to SQLRally Dallas! 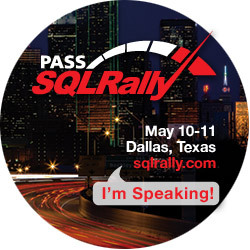 I’m hugely honoured to be speaking at SQLRally Dallas on Friday May 11th. My subject is ‘Business Intelligence and Azure: SSIS and SSRS Focus’ and I’ll be doing a demo which shows, ‘end to end’, how we can take some data, load it into the cloud usng SSIS, and then review it in SSRS. The whole Schedule is here so I hope you’ll think about coming along! There is an awesome list of speakers, and you can find the full Twitter list here. Now, I’ll be travelling 4735.87 miles – or 4112.63 nautical miles – or 7621.65 kilometres to travel from London to Dallas. I’ve never been to Dallas before, so I must admit that I’m nervous. I’m looking forward to meeting old friends and making new ones! However, I’m travelling all that way to see my SQLFamily. I love being part of the SQLPass community. So if it is your first time at SQLRally – please come and say ‘hi’! I’ve never been to Dallas before, so I’m new too! Please make sure to say ‘hi’ at the Community Corner. I attended SQLRally Nordic last year in Stockholm, Sweden, and it was just an immense experience. It felt like home since there were so many people there, who were passionate about all and any aspect of SQL Server, and I would love to go again. At SQLRally Nordic, I unleashed my inner Viking. In Dallas, I’ll unleash my inner Texan, and I’m looking forward to joining in all the community fun! There’s a serious side to SQLRally too. There’s a range of real experts, willing to share their knowledge and experience with you. I will share my knowledge on Azure, which I hope will help to make people’s jobs a bit easier by ramping them from zero to hero in Azure, pretty quickly! I will also be learning as well; there is an awesome list of speakers and I’m really looking forward to it. Without further ado, I’ve popped a lot of SQLRally information here for you, and I do hope you’ll register. If you see a little Scottish woman looking a bit lost, please come and say hi because it will be me! Register by April 29 to receive the special rate of $399! 60 real-world technical sessions across 5 tracks – the schedule is now live! SQLPASS are also offering these 7 deep-dive pre-conference seminars taking place prior to the conference on May 8-9 – get a sneak peek at the pre-cons in this Q&A series with our speakers. Still need approval to attend? Check out our tips on how to justify your attendance. Register for SQLRally Dallas today! I often hear requests for Power View to be made available outside of Sharepoint. Currently, Power View does require Sharepoint Enterprise 2010 and SQL Server 2012. I see that people are starting to love Power View. I love Powr View since I think it is facilitating businesses to ask the different questions of their data. If you want Power View outside of Sharepoint Enterprise, then go and vote for my Connect case here. You can have input to the roadmap by going to the Connect case and leaving your thoughts there. I do know that the Microsoft team do listen carefully to Connect cases, but I don’t see Connect being adopted widely by folks in the community to feedback their suggestions. The system requirements for Power View can be found here. Personally, I love Sharepoint and I’ve implemented Microsoft Sharepoint Business Intelligence solutions that really deliver value to enterprises. Yes, I am a Sharepoint fan! However, I do sympathise with small customers who do not have Sharepoint Enteprise, but would love to have some of the features. Power View is still ‘early days’ and I accept that other packages such as Tableau are much more mature. The debate of Sharepoint in Business Intelligence rages on elsewhere, and it isn’t the point of this blog here; instead, I’m focusing on this particular request for Power View outside of Sharepoint, which I hear often at User Groups and via my Twitter conversations. Technically, Power View is a Reporting Services Add-on. If you want more information on Power View, you can look at the Microsoft material here. I am not copying and pasting the information – I hate it when people do that to me! – so you can head over and take a look at the official Power View documentation. I’d like to add that the Power View training materials are superb, so well done to the team who’ve carefully produced this documentation. You can look at some of my Power View posts on my blog for my presentations, articles and so on. Currently, Power View is supported by a number of browsers: IE, Safari, and Firefox. What about Chrome? I’ve opened a Microsoft Connect case about this, and you can go and vote it up or down here. Chrome isn’t listed as one of the supported browsers. So, if you try and use Chrome for Power View, then it wouldn’t be supported and you may run into issues. This does not mean that it doesn’t work, and you might try it out and find that it works perfectly. However, I have run into issues at a client site in using Sharepoint, where the default browser was Chrome rather than IE. The issues were easily resolved by switching to a supported browser. I guess that the technical authors don’t list out unsupported browsers since it might be ‘chartjunk’ to do so. In other words, in order to keep the document as straightforward as possible, they’ve just listed out the browsers that they do support, rather than the plethora of browsers available that they haven’t tested for Power View. Other browsers include SimplePie, Lightning, Rockmelt, to name a few. Then you might also want to include ‘preview’ browsers as well, such as Bing Preview, whereby you ‘preview’ a page before you link on it. It would be nice to do this in Power View as well. In order to assess the requirement for Chrome, I’ve opened a Connect case here. If you’ve got a need for Chrome and Power View together, then you can vote and comment at the case. As always, you’re welcome to comment here, too, or over on Twitter. I’ve had some questions from people using the AdventureWorks tutorials on Analysis Services 2012, so I thought I would answer them here. The first thing to check is that the login has access to the data source. Also, check that you’ve put in the full server\instance name if required: if you’re not sure how to check, open up SSMS and see if you can connect that way, and the full path will be in the login box. If you’ve checked this, then it is worthwhile just checking that your Analysis Services service is actually started. This is simple: Go to Control Panel -> Administrative Tools -> Services and look for your Analysis Services service. If you don’t know which service to look for, try ‘SQL Server Analysis Services (MSSQLSERVER)’ and see if it is started. I hope that this answers some questions I’ve received – good luck, and please feel free to get in touch if anything isn’t clear. In response to my last blog, I received the question: ‘Is Power View supposed to be a replacement for Oracle OBIEE 11g?’ This blog is aimed at answering that question. Before we start, however, I would like to say that these opinions expressed here are mine, and no-one else’s opinions. Therefore, if I’ve got some of the Oracle details incorrect, please do feel free to correct me and I will be grateful that you’ve pointed me in the right direction. Power View, as I’ve said previously, is about helping business users to ‘surf’ their way through their data. It is designed to help them to think fast about the results of the data, and ask questions of it. It is therefore contrasted with other reporting packages which require a more ‘developer’ oriented focus, such as Business Objects WebI, Microsoft SQL Server Reporting Services. My experience with users would make me put Oracle BI Answers in more of a ‘developer’ pot rather than a ‘think as fast as you click’ pot. If you take a look at the Microsoft Books Online Power View documentation, it shows you how easy it is to create small data visualisations in Power View. There is no discussion of variables, or syntax, or anything that requires typing. On the other hand, when we look at Oracle BI Answers manual, we find that the discussion changes to include variables, custom date/time strings, formatting results and so on. Although this may be in the reach of many business users, it isn’t for everybody. This is in contrast to Power View, which requires minimal typing, drag-and-drop functionality with no requirement to create new formulae, making it simpler to use and assumes that the underlying data model is clean, correct and in place. I’m not criticising the Oracle BI Answers solution; instead, I’m saying that it seems aimed at report writers who expect to do additional work to meet a particular reporting requirement. On the other hand, Power View is aimed at those users who expect the data model to be cleansed and sorted for them already, without requiring further work to deliver the data visualisation other than point, click and publish. To answer the initial question: Is Power View supposed to be a replacement for Oracle OBIEE 11g? I don’t think that is the case. I look forward to your comments on this question.